Yesterday, November 25th, I consciously chose to release the spirit of my 16 year old fur-friend, Loki-Boy. He had been ailing for some time, not complaining much, just visibly showing signs that his physical state was frail and weakening day by day. I have so many areas on my carpet throughout the house that need to be deep cleaned due to Loki-Boy’s daily cat puke journey; yet it just doesn’t seem too important right now. I’m still in the process of grieving for my buddy, my gray boy who I rescued when I lived in Indiana and who rode with me (albeit drugged and sleeping) to Wisconsin. As a kitten, he used to lay on his side on my chest — much like the photo of him above (only with his head resting down, too). He was a mama’s boy, never one for fighting or confrontation. 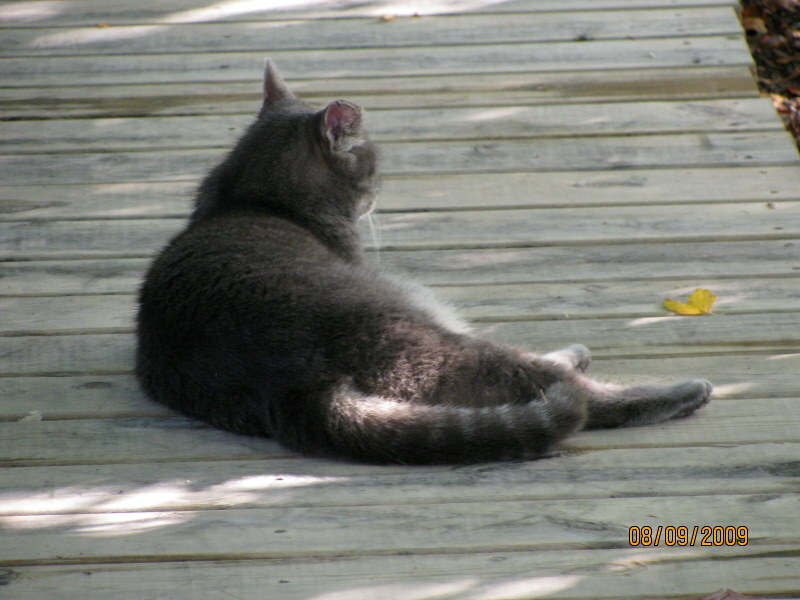 He trusted and got the short end of the stick on several occasions with other cats who would roam our property uninvited. He stood his ground but would more likely than not back down and walk away. I had to be the aggressor on more than one occasion. It’s not easy consciously deciding to end a fur-friend’s life. I always hoped he would just pass away from old age. I would find him in the closet (his favorite sleeping spot) one day and he’d be gone. But no, life had a lesson for me. Loss and Release. Forgive and Live. I struggled with the decision for longer than I wanted to. The endless variety of cat food samples trying to find something that would stay down. The middle of the night pukings and daily carpet cleanings. And finally one day, an inner calm spoke to me and said, “the loss will be a release, forgive and live.” I wasn’t quite sure what the release or the forgiveness was about until yesterday. Loki-Boy got up like he normally does, meowed a bit, looked at me with his big amber eyes that were losing their sparkle and I said, “Okay, bud. Let’s do this.” I put him in his carrier and he immediately starting wailing like he always does when we go to the vet. Upon arriving I started second-guessing myself. Am I doing the right thing. Afterall he looked pretty good this morning, maybe I should hold off on this…I’d done this a couple of times in the recent months. This time it was different — the words kept churning in my mind, “the loss will be a release, forgive and live.” My vet is a compassionate woman, very enfolding, as is her assistant. We go into the examination room. He fights me tooth and nail. I actually have to tip the carrier upside down so that he slides out on to the table. Good heavens, what am I doing. Once on the table though he lays down on his side, just like he used to do on my chest. He was done fighting. Just do it is what I could hear him say. The vet did her examination letting me know that he had lost a considerable amount of weight and that his vomiting was most likely due to a tumor…or not…but that the likelihood of him living a long life was slim to none. So, okay. I’m here, let’s do it. She gives him a sedative — I so appreciated this. Just inducing a calm state, letting him just go into a deep slumber state. She said it would take about 10 minutes for the sedative to work. She and I are doing a little side chatting, I’m sobbing, I’m stroking Loki and letting him know it’s okay to let go. And he starts to beat the table with his tail. Thump, thump, thump, thump. I looked at the vet, she looked at me. Thump, thump, thump, thump. I asked her if this was normal and she said that sometimes it takes a little longer with some animals. Loki continues to use his tail like a shaman beating a drum. Slow and consistent, never letting up. Twenty minutes later, he’s still doing his shaman journey. I’m getting nervous and wishing that she would give me some of the sedative. I continue to stroke his body and kiss his head. His eyes are open, his tail is thumping, his sides are lifting and lowering, deep breaths. I lean down and tell him goodbye, I ask him to say hi to Josie, Misha and Tessie and that our neighbor, Michelle, would like for him to say hey to her Willie who passed just a couple of weeks ago. Thump, thump, thump, thump. The vet asks, do you want to stay? It’s been about 25 minutes now. I look at Loki, laying there, looking serene, not moving except for his tail continuing to thump, I reach down and kiss his head again and I tell the vet, No. I can’t see him go like this. I thought it would be simple. I thought he would lay in my arms and just drift off and I would feel his spirit release from his body. That’s what I envisioned would happen. She assures me that he will not feel anything and he will go peacefully. I trust her implicitly and walk away. I sit in my car howling with grief, sobbing and wailing, I think I even banged my fists on the steering wheel. And then it was quiet. “The loss will be a release.” I just did…a huge emotional release. And I believe at that moment was when his spirit released as well. Loss and Release. Forgive and Live. The forgiveness was for myself. I had to forgive myself for making the decision, and then forgive myself for walking away before it was done. There have been moments of sobbing throughout the day…like now as I relive yesterday through this blog. When I related to my husband the journey that Loki and I had just been through and the pushing and pulling of my mental realm that I wished I would’ve stayed but I’m glad that I didn’t…he said, “you know, Jill, there’s no right or wrong way of handling these kinds of things. You did your best. What you left was Loki’s body, his spirit was released and will always be with you.” Forgive and live. Throughout the week I had been posting on my Facebook page that I was having to make the decision to put Loki down, then I posted that I had made the appointment. I had so many beautiful comments, truly magical, transforming, enfolding compassionate and loving comments from so many friends — connections. I am so grateful for them. So at this time of Thanksgiving, I give thanks for the unfolding process, for the love that is offered (both ways) and for the connections that go beyond where parallel lines meet in the Universe — if they ever do.